No matter which way you look at it, the notion of harvesting energy from the sun to power our homes and businesses is more absorbing than ever. Researchers at Rensselaer Polytechnic Institute have discovered and demonstrated a new method for overcoming two major hurdles facing solar energy. 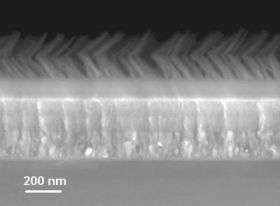 By developing a new antireflective coating that boosts the amount of sunlight captured by solar panels and allows those panels to absorb the entire solar spectrum from nearly any angle, the research team has moved academia and industry closer to realizing high-efficiency, cost-effective solar power. "To get maximum efficiency when converting solar power into electricity, you want a solar panel that can absorb nearly every single photon of light, regardless of the sun's position in the sky," said Shawn-Yu Lin, professor of physics at Rensselaer and a member of the university's Future Chips Constellation, who led the research project. "Our new antireflective coating makes this possible." Results of the year-long project are explained in the paper "Realization of a Near Perfect Antireflection Coating for Silicon Solar Energy," published this week by the journal Optics Letters. An untreated silicon solar cell only absorbs 67.4 percent of sunlight shone upon it — meaning that nearly one-third of that sunlight is reflected away and thus unharvestable. From an economic and efficiency perspective, this unharvested light is wasted potential and a major barrier hampering the proliferation and widespread adoption of solar power. After a silicon surface was treated with Lin's new nanoengineered reflective coating, however, the material absorbed 96.21 percent of sunlight shone upon it — meaning that only 3.79 percent of the sunlight was reflected and unharvested. This huge gain in absorption was consistent across the entire spectrum of sunlight, from UV to visible light and infrared, and moves solar power a significant step forward toward economic viability. Lin's new coating also successfully tackles the tricky challenge of angles. Most surfaces and coatings are designed to absorb light — i.e., be antireflective — and transmit light — i.e., allow the light to pass through it — from a specific range of angles. Eyeglass lenses, for example, will absorb and transmit quite a bit of light from a light source directly in front of them, but those same lenses would absorb and transmit considerably less light if the light source were off to the side or on the wearer's periphery. This same is true of conventional solar panels, which is why some industrial solar arrays are mechanized to slowly move throughout the day so their panels are perfectly aligned with the sun's position in the sky. Without this automated movement, the panels would not be optimally positioned and would therefore absorb less sunlight. The tradeoff for this increased efficiency, however, is the energy needed to power the automation system, the cost of upkeeping this system, and the possibility of errors or misalignment. Lin's discovery could antiquate these automated solar arrays, as his antireflective coating absorbs sunlight evenly and equally from all angles. This means that a stationary solar panel treated with the coating would absorb 96.21 percent of sunlight no matter the position of the sun in the sky. So along with significantly better absorption of sunlight, Lin's discovery could also enable a new generation of stationary, more cost-efficient solar arrays. "At the beginning of the project, we asked 'would it be possible to create a single antireflective structure that can work from all angles?' Then we attacked the problem from a fundamental perspective, tested and fine-tuned our theory, and created a working device," Lin said. Rensselaer physics graduate student Mei-Ling Kuo played a key role in the investigations. Typical antireflective coatings are engineered to transmit light of one particular wavelength. Lin's new coating stacks seven of these layers, one on top of the other, in such a way that each layer enhances the antireflective properties of the layer below it. These additional layers also help to "bend" the flow of sunlight to an angle that augments the coating's antireflective properties. This means that each layer not only transmits sunlight, it also helps to capture any light that may have otherwise been reflected off of the layers below it. The seven layers, each with a height of 50 nanometers to 100 nanometers, are made up of silicon dioxide and titanium dioxide nanorods positioned at an oblique angle — each layer looks and functions similar to a dense forest where sunlight is "captured" between the trees. The nanorods were attached to a silicon substrate via chemical vapor disposition, and Lin said the new coating can be affixed to nearly any photovoltaic materials for use in solar cells, including III-V multi-junction and cadmium telluride. Solar power tech is just barreling along. This is very exciting! Just note that the amount of sunlight "absorbed" does not equal the amount of sunlight converted into electricity. Still, this is a fantastic advancement and a significant piece of the solar power puzzle. Doesn't mention the efficiency of the solar panels with the antireflective coating? I wish it had..
7 more layers huh; what is the projected manufacturing cost/M^2? is that cost effective? How does one translate the absorption of the photons by a complex of nanorods to the use of those photons to generate electricity, as opposed to just more heat??? The one upside is w/ the ca. 96% absorption (as I was taught at RPI, 96.21% has just too many decimal points to be credible. It sounds like the very best value measured on a bunch of minuscule samples), the cells could be used for both heating and electricity IF they can be made cost competitively. A VERY BIG IF. Don't get excited until durability and environmental degradation is studied. For example, if tiny dust particles can easily get trapped in the "forest" and block light from reaching the collector it will render the coating useless. Just note that the amount of sunlight "absorbed" does not equal the amount of sunlight converted into electricity. Nor does it nullify lamberts law. Absorbing light, is one thing, converting directly to the electricity is another. Also, the amount of sunlight does depend on angle even for 100% efficient panels. x = sin(angle) so if light comes at 90 degree angle to the surface, it gets 100% of light, and 30 degree angle for example, will only give 50% efficiency, regardless of actual panel efficiency. This of course is assuming that all extra energy captured can be used to generate electricity not waste heat. Yay! Now less people have to do Algebra to see what the improvement to overall efficiency could be. Sounds like good stuff BUT. The silicon solar cells convert only some wavelengths of light to electricity regardless of the coating. The best silicon solar cells currently rate about 25% efficiency not 30%. Other types of solar panels are more efficient with (I think) the best rating at about 46% efficiency. A non-reflective coating is fine thing but it does depend on what wavelengths get reflected. If you currently reflect wavelengths you do not use then it does not matter. Absorbing all light is great but the absorption process may not necessarily preserve the wavelengths - and if it does not then it could make some solar cell panels less efficient than they are now. My points is that better in one aspect is not necessarily better for the application. Quite possibly a solar panel may need to be developed to make maximum use of the changed absorption level. The coating may be more useful in the short term for solar heating which can also be used to generate electricity. My last point was that all flat solar panels no matter how much light they absorb work better when the surface is perpendicular to the sun. So it is quite possible that this entire article is more of a marketing hype than a real product. Why not use mirrors for these solar panels as boosters? One mirror beside the panel and the other on the other side of the panel to cast sun rays on the panel. Nearly doubling the energy? And yet more mirrors, manyfold energy gathering? This is a separate development, which will enhance ANY solar cell, silicon or organic, they all get enhanced with a coating like this. It looks like it would make a 30% cell into a 39% cell. I do not agree: if you paint your solar panels black, you will now absorb all frequencies of sunlight; you won't improve you conversion efficiency (although I don't expect it to be that bad). Absorbing more energy, without converting it to electricity, just means with this coating, these solar panels will heat up more. Thats all. If Solar panels were lined with mini-tubes for heating water, and they were multi-purpose. Then we might have something here. Just so. Why not? Let´s take all possible energy without CO2. This seems to have better applications for solar towers and solar heating. If you were to coat a solar tower's coils in this stuff, then it would increase the rate at which the collected sunlight is converted to heat, thereby allowing you to turn far more water into steam. Star_Gazer said: Absorbing light, is one thing, converting directly to the electricity is another. Exactly. This does nothing to make solar panels more viable in countries like Canada. We're still going to have to use Fusion and Geothermal here rather than solar. Meanwhile we have an almost totally safe and VERY practical alternative to pouring millions in research money down a solar rat hole...nuclear. Nuclear is not cost effective. Even with heavy government subsidies and by ignoring the total cost analysis of nuclear waste it is still not profitible. Arguably the biggest barrier is finding a politician who is willing to put mutliple new nuclear reactors in his electoral area...or have people forgotten Chernobyl. Far better to use the nuclear reactor called the Sun that distributes its energy to every point on the earths surface for free. Well yes, the only problem is that we don't have efficient technology to harness solar (from cells, wind etc) for all places. We need to have a solution that can be used now but keep developing other technologies as well. Uh, not quite. The article (http://www.physor...63.html) is wrong about tracking arrays becoming irrelevant. The main reason solar cells become less efficient with angle of incidence (AOI) is they lose area. Think about it - a 1 m square panel held up to face the sun is then tilted 60 degrees, to a 30 degree AOI. It is now struck by half as much sunlight (sine 30 = .5). If conversion remains as efficient, power still goes down by half! At sunset and sunrise (AOI=0) direct light is zero, leaving only scatter to generate power. Though not a physicist, I could still improve performance more by increasing scatter, say by dangling a white sheet over the array. OTOH, the nano-coating would do nothing - efficiency is irrelevant when AOI makes area = 0. Nuclear is not cost effective. Even with heavy government subsidies and by ignoring the total cost analysis of nuclear waste it is still not profitible. Nuclear is cost effective even with all the exceptionalism and even when you pretend that unrelated research is a subsidy(weapons, fast breeders). ...or have people forgotten Chernobyl. Chernobyl proves the safety of nuclear power. Even without a containment dome, even with a badly designed reactor with a strong positive void coefficient, even with deliberately disabled safety systems and partisan political hacks appointed as operators, even with no accident response planing, even without alerting people to stay inside following the accident or distributing iodine pills only ~60 people died with up to 4 000 from cancers in the distant future if the LNT hypothesis is true(which it is almost certainly not; most low dose experiments have found hermetic or treshhold effects). Coal power in the US kills as many people as the pessimistic estimates for Chernobyl every ~7 weeks. In terms of deaths per TWh the deaths from solar panels exceed those from civilian nuclear power(old reactors and chernobyl included); people occasionally fall off of roofs and this small number divided by the pittence the panels provide becomes a rather large number. All energy is free. Solar energy just happens to be particularly hard to collect and particularly difficult to store compared to just about every other form of energy there is. I wonder what France does in terms of Nuclear power -which they are heavily invested in. Is nuclear really not cost effective? It is if the combination of regulatory turbulence, "environmentalists" and high interest rates aren't successful in running up the costs. You pay everything upfront(including ~$100 million in licence application and review fees in the US), if you're then stalled by frivilous litigation and regulatory ratcheting that requires you to redesign aspects of the plant in the middle of construction that won't make the interest on those loans go away while you're stalled for potentially years. In the US in the 70's it got so bad that the most expensive plants in the same size class where approximately 4 times as costly as the cheapest ones; this was entirely down to uncontrollable external factors, like accurately predicting regulatory changes down the line and incorporating them into the design before being required to do so and whether or not "environmentalists" took an interest in stalling your project. The french took a long hard look at which sources of energy they had available and desided that nuclear was the only sane choice. They used a few standard models of reactors that could be quickly approved without extensive simulations and review for each individual plant. They didn't let a tiny minority of the usual anti-humanists(e.g. Greenpeace, which oppose every practical power source, but especially nuclear) subvert democracy. And it wasn't that "environmentalists" didn't protest; hell some nutbar "eco-pacifist" even went so far as to fire 5 rockets from a russian rocket launcher at an incomplete research reactor(Chaim Nissim, who later became a representative of the swiss green party). The "waste" "problem" is simply nuclear exceptionalism. If you accept the premise that it's waste you could not rack up more deaths per TWh than coal even if you dump it straight into the ocean, completely unshielded at random locations, assuming it completely disolves and distributes evenly through the ocean(it doesn't, the fuel pellets are inert ceramic. See the spread of fission products and actinides at the natural reactor in Oklo; 2 billion years in what would be deemed unacceptable storage conditions and nearly all the radioactive waste migrated less than a few centimetres from the ore body), even assuming the LNT hypothesis is true. There are many storage techniques, any of which is fine. But since it's nuclear power the spent fuel has to have very strong guarantees (which will always be disputed by anti-nuclear activists no matter how strong the evidence) to be contained for millions of years until it is as active as uranium ore. I wonder what the cost of solar PV would be if one were to suggest that cadmium is toxic in any dose(linear no threshold dose response) that the cadmium telluride stays toxic forever(since cadmium doesn't decay) and therefor must be safely contained for as long as earth is inhabitable. Slow compared to what? We know that we could replace nearly the entire power production in a whole country with nuclear plants in a few decades if desired(We've done it before, see Sweden and France). It is frequently mentioned by "environmentalists" that few new nuclear plants have been built in the last 2-3 decades(depending on country), what is rarely mentioned is that nearly no new anything except for natural gas turbines have been built. I have long suspected an informal "bootleggers and baptists"-alliance between fossil fuel companies and anti-nuclear groups. The anti-nukes continue to promulgate the same tired bald-faced lies and continue to suggest ineffective long term solutions like wind power and conservation(what they don't tell you is that wind turbines are heavily dependent on coal fired spinning reserve and natural gas turbines to provide reliable electricity); I suspect that fossil fuel companies are all too happy to chip in some anonymous contributions as long as they keep being effective at greenwashing fossil fuels. I always seem to get myself excited by these newly reported developments only to have my hopes dashed over issues such as reliability, cost, efficiency or not repeatable so-called developments. I will keep abreast of this new claimed development but with a jaundiced eye . who said a solar panel had to be flat. Add to that the notion that this coating is most effective generating heat and that can produce depending on the substrates, electricity. Solar Cell Directly Splits Water To Produce Recoverable Hydrogen....... now there's more hydrogen but then there's storage or conversion. what have you got that moves us forward? I know, a series of compromises that establish best practices with a satisfactory outcome. The surface of the solar cell looks like a forest of crystals, which got me wondering if (considering that light is EM radiation) that a similar forest of nano antennas with nano diodes at one end could work for light like a rectenna works for microwaves, just at the shorter wavelengths of light, about 400-700 nanometers. Perhaps carbon nanotubes? That's a good idea derricka. Using carbon nanotubes to form a fractal antenna would (to my mind) be especially useful for a whole range of extremely high frequency EM bands. Also, I wonder if this might be a potential answer to supplying nano machines with power. I think the question of the cost is the most essential-the efficiency only comes next. Because people would be more willing to buy panels at low cost than to invest in high-cost high efficiency panels. Simplicity is the way into the market. And the improvements will follow the extensive use.